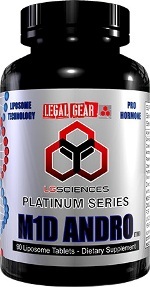 Estrogen is an important hormone especially those looking to build strong, dense mass – is often times a dreaded word. While estrogen certainly has its uses, the overabundance in men can cause some seriously undesirable effects. Some of those include; a smooth look, bloating/water weight gain and even increased fat. All in all, too much estrogen undoubtedly will make you look puffy and fat. More importantly though, estrogen is also one component of the “NEGATIVE FEEDBACK LOOP” that tells the body to stop making testosterone. Yep – you heard that right. Too much estrogen can actually reduce your bodies' testosterone output. Shockingly scary for us testosterone loving freaks!! 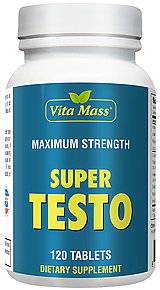 Conversely – the body will produce more testosterone when you block estrogen. 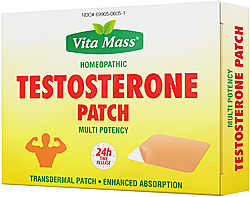 In a nutshell, when estrogen levels are low, the body thinks it needs to ramp up luteinizing hormone and subsequently testosterone production. Vice versa when estrogen levels are high, it tells the body to hold up on T-production. 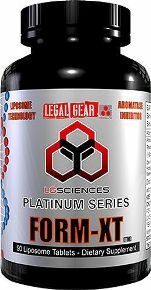 This results in an increased testosterone production and the prevention of estrogen-related side effects.Arom-X RD™ contains three powerful and unique ingredients, which have been shown in scientific literature to effect estrogen production, and may increase testosterone by doing so. We didn't throw a whole bunch of ingredients on the table and hope some of them would deliver. Instead, careful thought and planning went behind the choice of these ingredients to deliver the most effective formula we could design. Included in that planning was how to use the best delivery method for this unique blend. Tablets and powders oftentimes are the best choice of delivery. Yes, they are common and everyone uses them but does that make them the best choice? You know the answer. ?Arom-X RD™'s test boosting trifecta is complexed into a unique oral delivery called “rapid dissolve”. The specific active chemical vector is Hydroxypropyl Beta Cyclodextrin (HPBCD). HPBC forms stable aqueous complexes like Arom-X RD™, enabling hydrophobic molecules to penetrate body tissue. RD™ is such a unique delivery system because it encapsulates the active molecular compound in a way that prolongs residence in the bloodstream, enhances intracellular penetration and preserves the active molecule until it reaches its desired location in the body. ?In order to utilize the RD™ delivery system effectively, Arom-X RD™ only contains pure grade actives compounds of the highest quality. 90% active compound purity and higher is a standard for AMS. Enough talk – let's get into the product. Help me throughout my long day feel more energetic and give me more boost working 12 hrs a day and still able to workout!! !